Indoor grilling: Can it ever compare to the real thing? Can grilling inside an apartment ever compare to the real thing? Summer can be a depressing time for food-loving apartment dwellers like me. Between Memorial Day and Labor Day, cooking magazines arrive offering “Juicy Grilling Secrets” and “55 Ways To Spice Up Your Grill,” while most Food Network programming feels like an anthropological documentary about suburban charcoal-worshipping rituals. My heart sinks a little when an otherwise appealing recipe from the newspaper contains some combination of the words build, fire, ash, and coals. To be clear, I enjoy a flame-kissed hunk of protein as much as the next meat eater, but due to the nature of city living, I have very few options when it comes to grilling outdoors. I have neither the stomach nor the competitive nature to duke it out with my neighbors over the squalid public grills in the park. And before you suggest a portable Weber on the fire escape, know that the Fire Department once gave my building a citation for the three small herb plants that were cheerfully growing out there—that trauma killed my dreams of grilling as quickly as it killed my basil. First, you need the right equipment. As anyone who has conducted Google research on this issue will know, indoor grill can mean many different things. The one thing it doesn’t mean, of course, is bringing an outdoor charcoal or gas grill into the living room—you shouldn’t do that, ever. But the range of grill technology that won’t asphyxiate your family and burn your building down is still broad: There are George Foreman-type contact grills, special appliances called “open” or “freestanding” grills that sit on your countertop, fancy versions built right into your cooktop, and Space Age devices meant to mimic rotisseries and smokers. Even using the open flame of your oven’s broiler kind of counts as grilling—it’s the same concept, just upside-down. And real, honest-to-God grilling is what we want, after all—a cooking technique more extreme than the ho-hum pan frying or oven baking with which we usually treat a chicken breast. 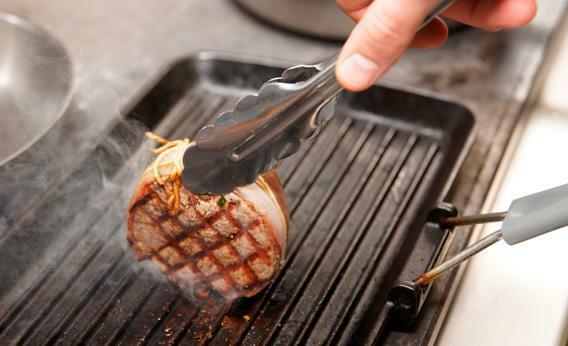 Food scientists define grilling as cooking food relatively quickly with intense, dry, and direct heat (usually from below, necessitating a flip halfway through) and very little additional fat (whether oil or butter). The most noticeable characteristic distinguishing grilled meats and vegetables from foods cooked differently is the crispy crust that forms due to the “Maillard reaction,” a process in which amino acids react with sugars to produce browning and a bevy of wonderful and not entirely understood flavor compounds. Grill pans are very good at producing this reaction (as long as you preheat them long enough), whereas contact grills and similarly enclosed contraptions often end up steaming the food in its own juices rather than grilling it. Moreover, many specialized machines don’t allow for much in the way of temperature control, which makes it difficult to transition from searing a piece of meat over high heat to cooking it through over mellower heat (or vice versa). Not so with grill pans, which are limited only by the thermal nuance of your burners. However, having the right equipment is only half the battle; indoor grilling presents a host of other potential pitfalls that I have selflessly tumbled into for your benefit. For starters, because you’re not working in the great outdoors, smoke loses much of the romance it is normally afforded in grilling circles. I learned this lesson the hard way at a recent dinner party when I rounded the corner from kitchen to living room to find that my guests looked like coughing phantoms in a haze of the stuff. To be sure, there is no way to avoid some amount of smoke when working at high temperatures, but there are definitely ways to reduce it. This is where protein prep comes in. By all means marinate, but be sure your meat has been patted very dry with paper towels before putting it on the grill pan. Be especially sure that no bits of minced garlic, onion, or ginger remain on the surface of the meat, as they will surely fall into the cracks between the ridges and burn to a bitter crisp. Additionally, avoid recipes that call for coarse rubs containing seeds like mustard, cumin, or coriander; these will only serve to coat your pan’s valleys with a noxious-smelling black paste. What will work, however, are dry powder rubs, which adhere tightly to meat if you rub it with a few drops of oil first. Speaking of oil, do not glug it directly into your pan. Instead, take grilling guru Steven Raichlen’s advice and use a paper towel to lubricate only the ridges to prevent sticking, as pooled oil in the valleys interferes with the dry part of dry heat and is, in any case, very likely to burn. This is no place for olive oil; canola or grapeseed oil, with their higher smoking points, are better suited to the task. Apart from smoke, indoor grilling’s main drawback is splatter. As meat releases its fat and water content on a regular grill, these liquids fall into the heat source and are instantly resurrected as flavor-imparting vapors. On a grill pan, they rudely explode all over your stovetop, counters, cookbooks, pants … anything within a 1- to 2-foot radius, really. There’s no way to avoid this without making other sacrifices. You could, for instance, loosely cover your grilling meat with aluminum foil, but doing this for too long conjures the dreaded specter of steam. You could also compromise your grilling credentials and finish off the cooking process in the oven after an initial searing. But if you choose to go the distance, be prepared with a damp dishcloth so you can occasionally wipe things down. As for approximating those flavor-giving vapors: Grilling purists will argue that indoor grilling simply cannot compete with the smoky deliciousness that charcoal or wood impart, and they’re right to some extent. But that doesn’t mean you can’t cheat with a little bit of creative spice hacking. Consider adding a pinch or three of smoked paprika (known in Spanish as pimentón), chipotle powder, or smoked salt to your rubs or a few drops of natural liquid smoke to your barbeque sauces. These will provide enough sooty notes to satisfy all but the pickiest of diners. And if anyone does give you flack, inform them that they are welcome to go parry with strangers over that rusted public grill in the park. You will be waiting back in the air conditioning with your crisp rosé and perfectly seared steak for when they return with their sweat, warm beer, and precious authenticity.